I was born and raised in Salt Lake City, Utah, the youngest of five children. My siblings are ten to eighteen years older than I. Because they were so much older, I was exposed to concerts, museums, and of course, reading from a very early age. Somebody read to me daily until I could read myself, which was before I went to kindergarten. As I grew up, my family took foster children and specialized in those with disabilities. With that experience, I began my college education majoring in Physical Therapy, but changed to Recreation—Youth Leadership and Therapy. I have evaluated and directed camps for children with disabilities. Little known facts about me: During my college years, I was on the University of Utah Synchronized Swimming Team for four years. I couldn’t even swim till I was 18! For several years I managed a group home for three men with severe disabilities. I have also taught school, been a Girl Scout leader (after being a girl member since I was 7! ), taught Sunday School, and I homeschooled my three youngest children for 2, 7, and 9 years until each graduated from high school. During that time, my daughters and I participated in a local arts college. It was there we did 13 different shows. It was a wonderful experience for all three of us! I have worked in animal rescue for years, and have been owned by three former puppy mill mamas and several rescued cats. I love to crochet and keep my grandkids supplied with toys and other things! I am now living in New England where three of my six children (and six of my twelve grandkiddos) live. I have written off and on for years. I never kept a journal because I realized I only wrote in them when something bad happened, and I didn’t want someone finding my journal years from now thinking that I was unhappy most of the time. I have written several articles and poems that were published in newsletters, but it was 2007 when my older son finally talked me into trying NaNoWriMo. That was where my first novel was born. I write Christian fiction, and because it involves angels and demons, it makes it paranormal. My faith is very important to me. I believe it is possible to write good stories without profanity or sexual content. I love the freedom I feel when I can let my imagination go, and I just write. It is an adventure to me. Sometimes when I write, I have no particular goal in mind, but just write, and see where the story takes me! I find it is therapeutic for me, too. My least favorite part of writing would have to be the struggle I go through deciding whether or not to let my writing “go public” by allowing someone else to read it. My stories come from what I have experienced or what I have seen or heard about. I am an observer of people. My own experiences that I write about. No two people can have the same experiences, even if they go through something at the same time. No two people would tell the same story the same way. That may sound obvious, but that is how I write. Yes, I love to read. I love the classics, as well as other Christian fiction. I also like biographies and animal stories. Also, I have recently enjoyed Joe McCoubrey’s Someone Has To Pay and Brad Fleming’s Role of Dishonour. My first book, Victory, is scheduled to be released the first part of December 2012. It is the story of a small town whose people cherish faith and freedom. They are friendly and helpful to each other in spite of personal differences. But something happens when a man comes to the town and slowly takes away the freedoms the people have loved but taken for granted. What about the child Brown Eyes? What is her role in this story of faith and patriotism? Links to DeEtte Beckstead’s website, blog, books, etc. BE SURE TO COME BACK to read more about DeEtte and her release, VICTORY, on Wednesday’s Karen’s Killer Book Bench! 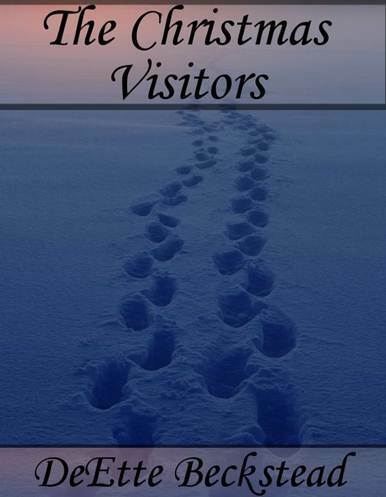 **SPECIAL ANNOUNCEMENT: DeEtte will give away a copy of THE CHRISTMAS VISITORS to two lucky readers!! Comment on either her Monday Interview and/or Wednesday’s Karen’s Killer Book Bench blogs for a chance to win. Winners will be randomly selected and announced Monday, December 10, 2012. Thanks, DeEtte, for sharing your story with us! What a beautiful interview of a fascinating, warm, compassionate woman and writer. I was enthralled with DeEtte’s personal story – and she’s right, we each experience ‘things’ in our life differently. Thus, we could write about an experience in so many ways, depending on which character’s perspective we’re writing about. Good luck to DeEtte – she sounds like she knows her path, and she’s traveling it well.